Stand-off techniques have received increasing attention as valuable methods for material analysis at remote distances. This is particularly relevant when looking at hazardous contaminants in the environment or residual explosive material, where it is desirable for the analyst to remain at a safe distance from the material being investigated. Work carried out by Prof JJ Laserna’s group at the Dept of Analytical Chemistry in the University of Malaga, reported by González et.al , explores the use of stand-off Laser Induced Breakdown Spectroscopy (stand-off LIBS) for the detection of explosive residues in situations simulating ‘real environment’ scenarios. They looked at the feasibility of detecting the likes of improvised explosive materials (IEM) through windows such as those in cars or buildings or within various types of container. A telescopic system was used to focus a high power pulsed laser to a spot on the material to produce a micro-plasma. The same telescope collected the light emission from this plasma which was then analyzed in a spectrograph using the advanced time-gating of an intensified CCD camera. The ability to detect dangerous contaminants, improvised explosives(IED), home made explosives (HME), or nuclear by-products, has become of increasing importance due to heightened risks in recent decades. In their work, Gonzalez and co-workers set out to test the feasibility of making such measurements with their TELELIBS sensor, and to assess the influences that the barrier position and its composition might have on the quality of those measurements. In allied work the group looked at the influence of atmospheric turbulence on beam propagation to and from the target , where they showed that measurements over several tens of meters could be significantly affected by atmospheric turbulence. A schematic of the typical experimental set up used by the Malaga group is shown in figure 1. 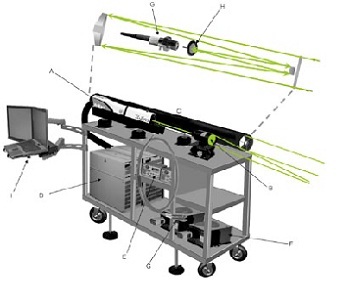 It consists of a telescope which takes the light from a laser and focuses it on to a target at a distance of typically 30 m. Two Nd:YAG lasers were used at the fundamental wavelength of 1064 nm, delivering 5 ns long pulses at 10 Hz, and energy of 800 mJ. The two laser outputs were arranged to be overlapped in space and time so that the overall irradiance on target was doubled. The emission light from the micro-plasma was collected by the same telescope and delivered into a 600 µm core diameter fibre via a dichroic mirror. 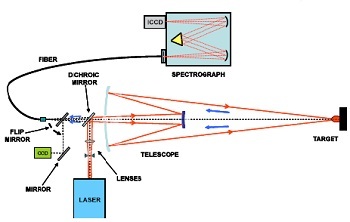 The excitation source was reflected by the dichroic mirror into the telescope whilst the returning atomic emission light was transmitted through the mirror, where it was then coupled into the optical fibre for delivery to the spectrograph. A Czerny-Turner spectrograph (Shamrock 303i) with an intensified CCD camera (iStar DH740-25F-03) was used to detect the emission. In any LIBS experiment one of the main challenges in attempting to collect discernible atomic emission line spectra is to reject the broad band continuum which occurs during the incidence of the laser pulse and immediately afterwards as the plasma plume evolves. This broad continuum tends to dominate the emission early in time resulting in little or no atomic line data being evident. However, an ICCD allows the acquisition by the camera to be delayed for a time in order to reject this early continuum. In this work a delay of 400 ns was used along with an exposure or integration time of 9 µs. Among the substances investigated were sodium chlorate (NaClO3), dinitrotoluene (DNT), trinitrotoluene (TNT), and some plastic explosives (C2 and H15). A number of barrier materials, including clear glass, some tinted glasses, and colorless PMMA (a polymer material) were placed in the beam path. The team investigated the influence of the target-to-barrier distance on the measured signal to background (S/N) ratios, along with the influence of the optical characteristics of the barrier material, thus accounting for the transmittance of excitation laser light and the returning plasma emission. A suite of chemometric tools were used to analyze the spectral data for the presence or absence of explosive residues. Figure 2: Schematic picture of combined LIBS-Raman system used by the Laserna group. G – fibres, H – notch filter, I – laptop. A number of spectral bands and atomic/ionic emission lines were chosen for fingerprinting and subsequent identification of the explosive substances: examples of such features included the CN band (388.3 nm), the C2 band (471.5 nm, 516.5 nm and 563.5 nm), and the Al (I) line (469.4 nm) among others. The ability to detect a residue was determined by the ‘sensitivity’ and ‘specificity’ of the measuring system. Sensitivity is related to the system’s ability to identify the presence of an explosive material if it is present i.e. the system flags up the presence of the material when it should. Specificity is related to its ability to identify explosives only if they are present i.e. the system doesn’t flag up the presence of explosive when it shouldn’t. González and co-workers assessed the capability of their system by measuring the sensitivity for the different residues with the different barrier materials. By increasing the number of laser shots it was possible to increase the detection to 100% sensitivity without impacting on specificity. Gonzalez and co-workers successfully demonstrated the feasibility of using the stand-off or TELELIBS technique for detection of explosive materials through different types of window or interposed barriers, as long as there was a clear line of sight from the sensor system to the target. They also demonstrated that relatively few laser shots were required to ensure a high level of detection capability and means of distinguishing different residues and that the position of the barrier relative to the target and sensor was unimportant to the analysis. A key enabler for this type of work is the high sensitivity and gating versatility offered by the iStar ICCD camera. Research and validation on stand-off analysis techniques has gained much momentum as demands grow for safe, convenient and quick ways of testing for improvised explosives devices and other hazardous contaminants in the environment.